For a variety of reasons, affluent investors who can pay cash for everything simply do not do so. When a family sits down to create or update their budget, the most difficult items are the liabilities they have. 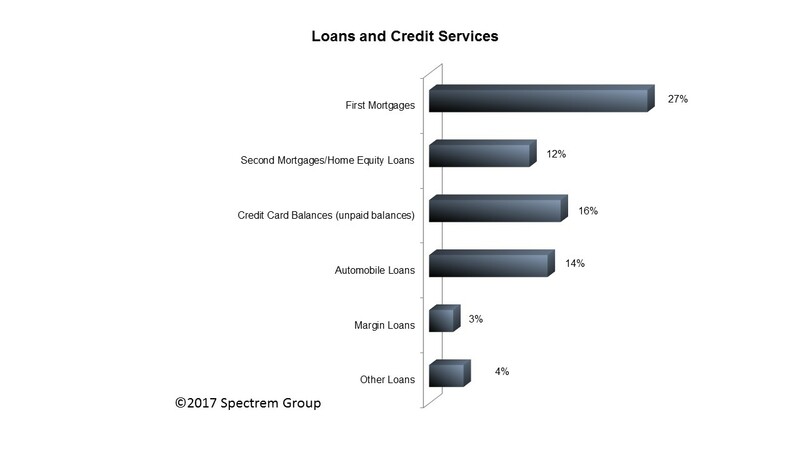 Mortgages, automobile loans and credit card balances are the bitter pill that most Americans deal with daily, weekly or monthly. But one of the revealing insights from Spectrem’s annual examination of the asset allocations of affluent investors is that many, including those with a net worth as high as $25 million, maintain liabilities of the same sort as people who are not as well-to-do. Advisors can inquire with their investors what level of liability they wish to maintain, and should definitely assist the accounting process by keeping an eye on an investor’s liabilities in respect to their investments and asset levels. Spectrem’s study – Asset Allocation, Portfolios and Primary Providers – looked into the liabilities of investors from three different wealth segments, starting as low as those with $100,000 in net worth not including their primary residence to those with a net worth as high as $25 million. Among the Ultra High Net Worth investors with a net worth between $5 million and $25 million, 27 percent maintain a first mortgage. The mean value of those loans is $280,000, an amount most of those investors could certainly pay off. Twelve percent of those investors also have a mortgage on their second or vacation home, but again the average loan amount is low, only $144,000. There are some wealthy people who show off their wealth by buying expensive vehicles (although not as many as you might guess; the Spectrem study shows that only 17 percent of UHNW investors spent $25,000 or more on automobiles in the past 12 months). Fourteen percent of all UHNW investors have automobile loans, but the loan amount is $43,000. Sixteen percent of UHNW investors have unpaid credit card balances with average balances of $20,000. Advisors can discuss these liabilities with their wealthy investors to determine if there is a better use of their funds rather than maintaining the loans. The highest percentage of these loans belong to the youngest UHNW investors, those under the age of 52. However, many World War II investors maintain notable mortgages, loans and credit card balances. The UHNW investors are the wealthiest ones in the study. Millionaires, those with a net worth between $1 million and $5 million, are more likely than the UHNW investors to have outstanding debts, although the loan amounts are lower in most cases. For instance, 39 percent of Millionaires have a first mortgage (only 27 percent of UHNW investors do), but the loan amount average is $188,000. One-quarter of the Millionaires have automobile loans owing $18,000 on average. Twenty-one percent of Millionaires have outstanding credit card balances to the tune of $21,000 on average. As with the UHNW, the younger investors are the most likely to have these loans, although their net worth is similar to the older Millionaires. A surprising 74 percent of Millennial Millionaires have a first mortgage, and 48 percent have automobile loans. These investors are balancing their assets and liabilities. The question to ask is whether this is the best approach to investing. Would it be beneficial to speak to your investor’s accountant about the balance sheet? Obviously, the money being spent on interest payments could be invested instead. Each investor is going to have a different tale to tell in regards to liabilities, but advisors can (gently) inquire as to why an investor who can pay for an automobile outright does not do so. Redirecting the funds assigned to interest payments into investments can be a win-win for investors.